Scientists from India conducted an experiment to determine the kinet ics of the production of biodiesel. 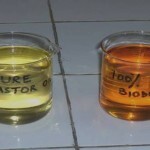 Transesterification of castor oil was carried out with methanol and sulphuric acid as catalyst under different temperature conditions. The obtained results were analyzed with respect to three types of reaction kinetics and it was concluded that the experimental data followed second-order reversible reaction kinetics.